We are in the thick of it now. We are five weeks in, and only yesterday it seemed like the semester had just begun. And now, as you hear of seniors applying for Spring graduation, it may seem like the world of academia is crashing down on you. 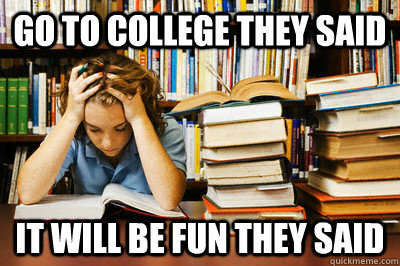 With mid-terms just around the corner, it is a safe bet to say that many of us are struggling. For some, the course load may seem like it is too much and for others, the pressures of organizations and non-school are mounting as each day passes. So, take a breath. We here at the Prairie have been where you are. We have been stressed about papers and due dates. We have lost sleep over and over because sometimes it all just seems like to much. But we can tell you from experience that it gets better. It may seem unsurmountable, but it when the going gets tough, we Buffs find a way to get through it. Some would say if you aren’t struggling, you aren’t doing college right. That may or may not be true, but the important thing is that you stick to it. College may not always be the easiest, but it has the potential to be the most rewarding.